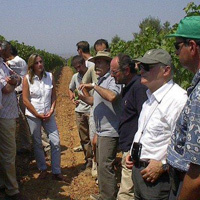 Study of the characteristics of the environment and land where the vineyards will be planted. Analysis of the particular soil and climate conditions, from the infrastructure permitted by the morphology of the area to determining the best planting density. 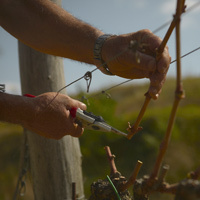 Choice of vine varieties and clones suitable for the conditions of the site. Definition of the machinery involved. Knowledge of a company’s particular terroir acquired from consistent agricultural presence throughout the year enables us to select grapes from different homogenous areas of the vineyard at the optimal moment of ripeness. In this way, vinification is respectful of the fruit and the wine is the expression of the grape variety, the land and the company’s style. Particular time and attention are devoted to training staff and monitoring the correct execution of operations in the vineyard. It is only by knowing the end result of a specific intervention and how the vine reacts to it, that it is possible to create the basis for the type of informed action that makes all the difference in quality viticulture. Our viticultural practice, geared towards the regulation of vigour and the homogeneity of the plants and vineyard increases the tolerance of vines to adversity and stresses, effectively reducing the environmental impact of the crop. For the viticulturist the transition to organic management of the company becomes easier and less expensive. The Aminea team organizes special days for the companies it follows. 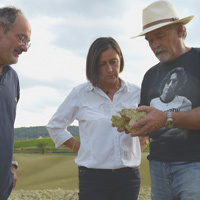 These feature study and research on various oenological topics and issues that emerge during the wine year, as well as practical training days on pruning and on the management of the leaf canopy, and group tastings of wine from different wineries.